Sometimes you just have to go with your gut and choose a recipe based on flavors you like. The other day I did just that with ... Savory Winter Squash! Preheat oven to 350 degrees. Cut squash in half and remove seeds. It is a true science to cut into Fall/Winter Squash!! Mix ingredients above and let the flavors meld in the baking dish you plan on using. 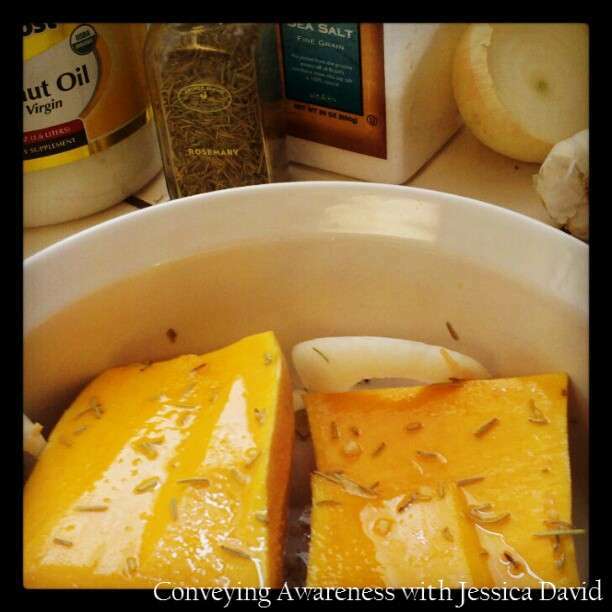 When oven is ready, place squash in the baking dish skin side down. Baste the squash with the oil blend. No cover needed. Baste the squash with the oil blend every 20 minutes while it's baking. Your squash is done when a fork can push through the thickest part of the squash with ease. (Note: You can leave the skin on. If it's baked enough, the skin will peel off with little to no effort or you can eat it.) It took about 50 minutes to bake. I enjoyed this one as a stand-alone dish. I frequently eat veggies by themselves. I believe they make an excellent meal choice! Nutritional benefits of winter squash as per WHFoods.